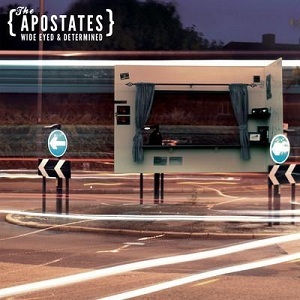 The Apostates are a three piece band which formed in 2006 in London. Since then they've played over hundreds of gigs as well as a session for the Radio 1 punk show. They're described as "melodic punk" - in other words nothing at all like 70s/80s style punk, more an indie rock/alternative hybrid. If you ignore the punk label and accept it's a hybrid of indie rock and alternative, then the album makes more sense (I doubt there are many people who'd classify this as punk). In that light, it's actually a very good album. The vocals are very good and thetunes are well written with a nice rock feel. Check out the video for "Fire Blanket" below and have a listen for yourself what the band sound like. It's one of the best tracks on the album ("Acrylic friends" is another great track worth listening to) and gives a good idea what the rest of the album sounds like. If you can't be bothered to sit through the long silence at the end of "You have got to be choking" then I suggest skipping to the 10 minute mark to hear the hidden track. I really don't see the point of the five minutes of silence - people will either skip the hidden track completely or just skim through till they find it - when the main song ends five minutes into a track that your PC tells you is over 12 minutes long then its usually a fairly obvious sign of a hidden track. Hidden tracks are a silly idea - just add it as a separate track (skip it from the track listing by all means) and it plays a lot better.